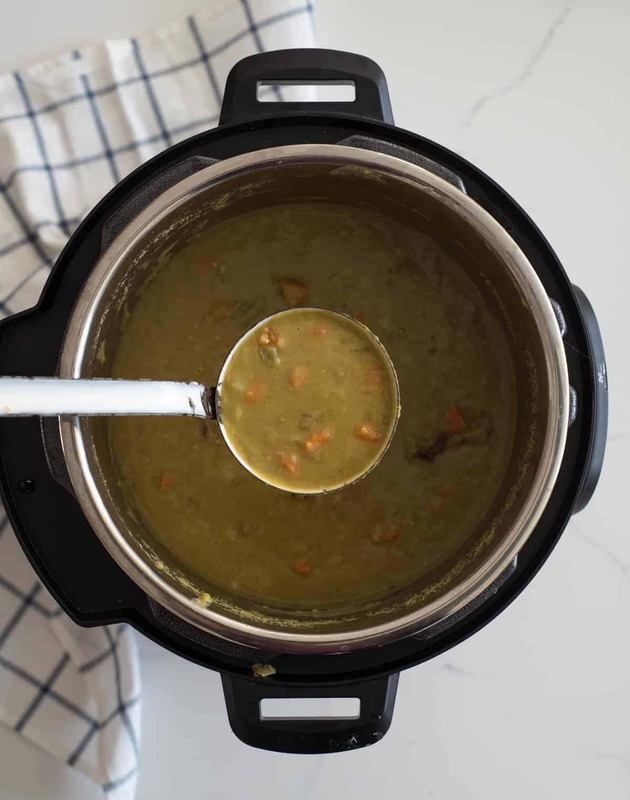 Quick and easy Instant Pot Split Pea Soup made with just a few ingredients and done in about 40 minutes, start to finish. 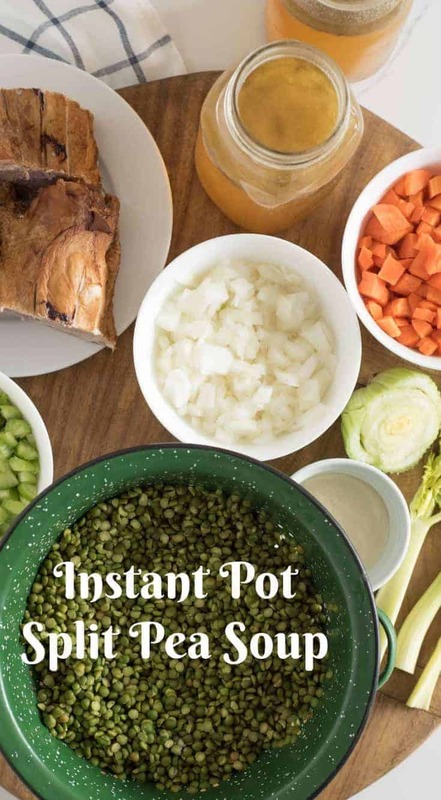 Long live all the easy Instant Pot recipes! 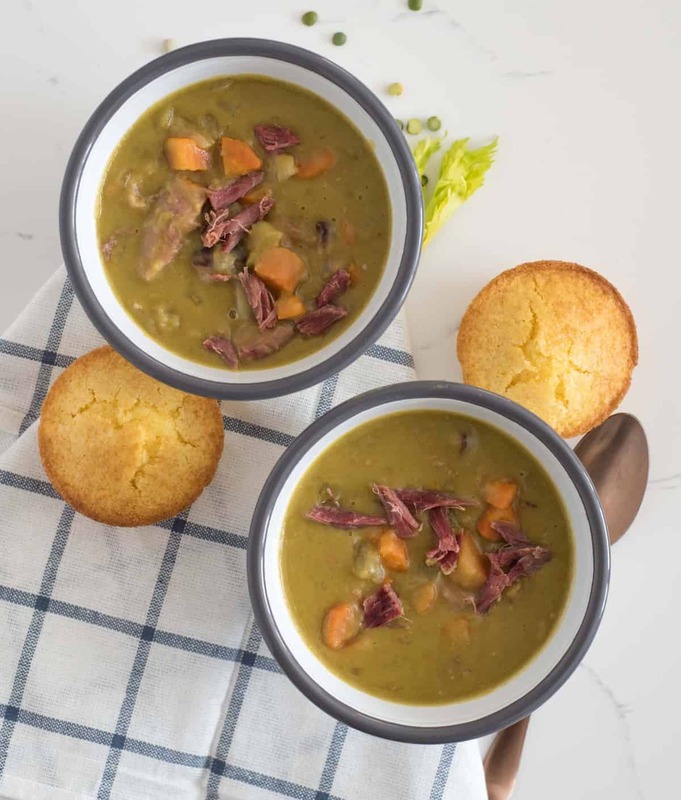 I’m so excited to share this Instant Pot Split Pea Soup recipe with you today because it’s one of my favorite soups, done in the pressure cooker, and it only takes about 40 minutes to get on the table. It’s full of veggies, is really inexpensive to make, and is hearty and full of flavor. 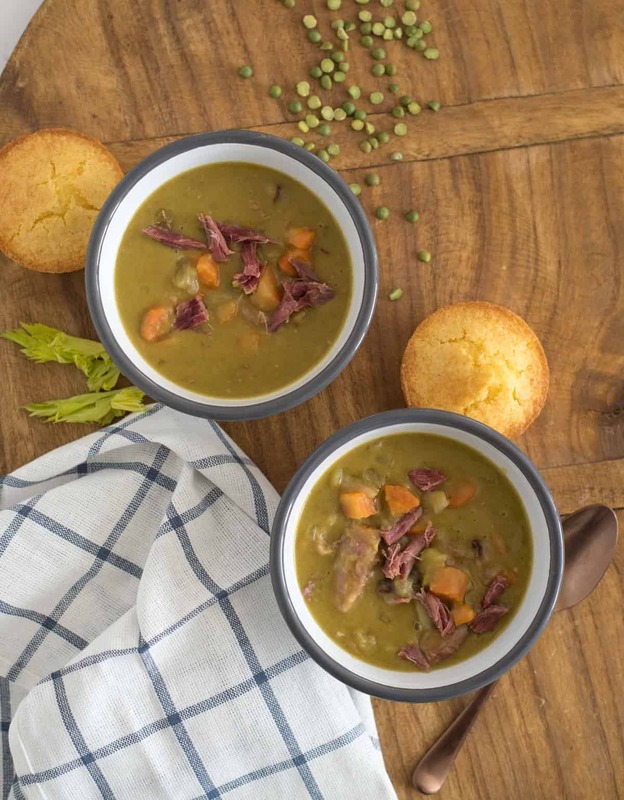 I feel like split pea soup gets a bad rap because of it’s thick texture and green color, but I’m here to tell you that it is awesome! It tastes just like other ham and bean recipes but takes a fraction of the time. Today I’m working with Hurst’s Beans again (love them!) with their split peas. Split peas are one of those hidden gems that not enough folks are using. I love them because they are high in protein and fiber and have all kinds of vitamins and minerals. They are also fun to work with because they break down when cooked, meaning you don’t have to process anything in the blender or food processor to get a smooth soup. The only chunks in this soup are the veggies and a little bit of ham. The split peas just make everything thick and creamy. The soup will thicken a lot as it cools, so serve it hot or thin it out with some broth as needed. I tried this recipe with and without the included seasoning packet and I really liked using the seasoning packet. It adds a great smoky flavor. It’s gluten-free too. If you are sensitive to salt though, try adding only half and adjusting additional salt to your liking. You are free to use the pork/ham product of your choice – using a leftover ham bone works great. I just toss my ham bone in a zipper-topped freezer bag after dinner and keep it in there until I’m ready to make soup. Feel free to leave out the meat if you are looking for a meatless meal, but if you do that, be sure to add the seasoning packet for that smoky flavor. You can make this vegan by using olive oil instead of the butter and omitting the meat. Easy! It’s also gluten-free as long as your meat is. I love this recipe with a side of my forever favorite cornbread. 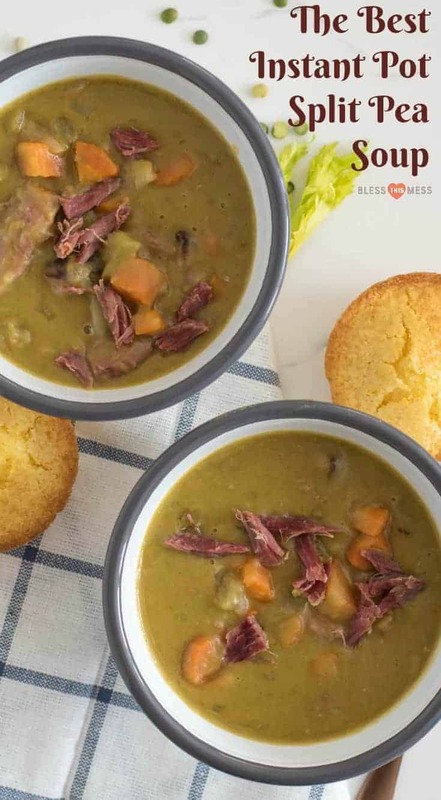 Sweet cornbread and smoky ham and split pea soup is so very good together. You can make this on the stove top by cooking it for about 40 minutes until tender or in the slow cooker on low for about 4 hours. 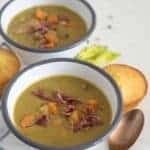 Quick and easy Instant Pot Split Pea Soup made with just a few ingredients and done in about 4o minutes start to finish. Add split peas to the pot, add the seasoning packet, and the broth. Stir to combine. Lock the lid in place, make sure the vent is set to seal, and select high pressure and 20 minute cook time. Adjust salt and pepper to taste and serve hot. The soup will thicken a lot as it cools, so serve it hot or use a bit of broth to thin it out as needed. I tried this recipe with and without the included seasoning packet and I really liked using the seasoning packets. It adds a great smoky flavor. It’s gluten-free, too. If you are sensitive to salt though, try adding only half and adjusting additional salt to your liking. 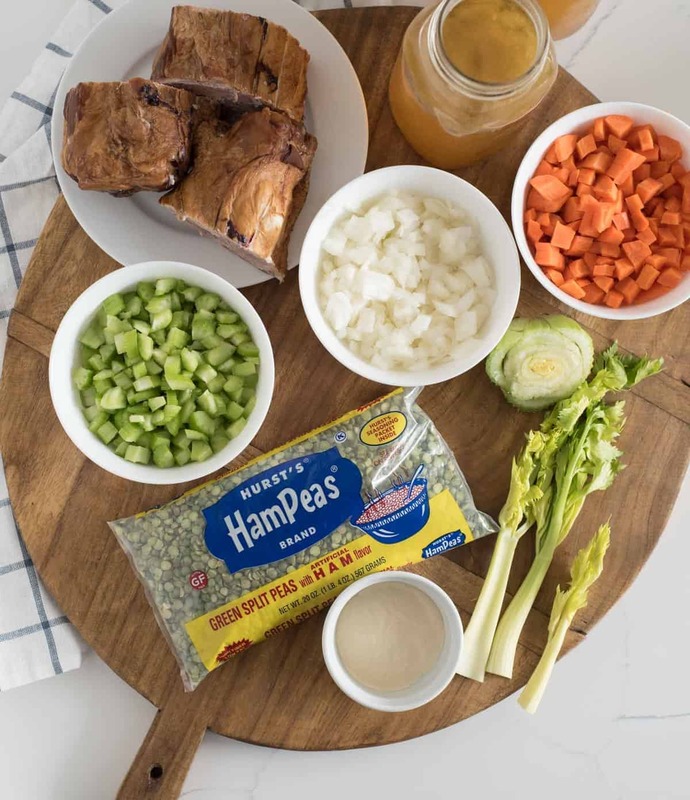 I can’t wait for you to make this Instant Pot Split Pea Soup! 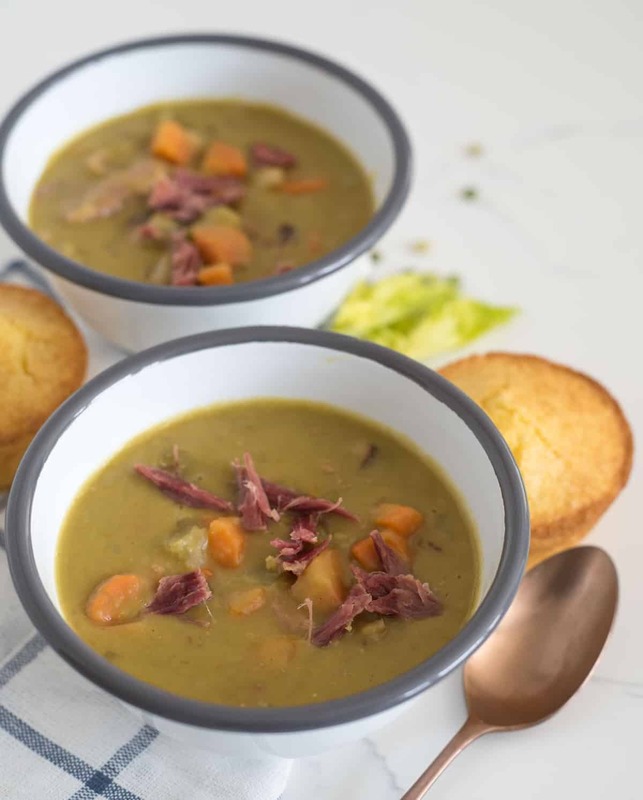 It’s great all winter long but don’t forget to file it away for naturally green dinner ideas for St. Patrick’s Day (because whose kids really eat corned beef and cabbage?!) or an easy meal after Easter using your Easter ham bone. Enjoy from my home to yours.